A review of Scott Pruitt's conduct by White House officials is underway, adding to other probes being conducted by congressional committees and EPA's internal watchdog. WASHINGTON — The Environmental Protection Agency’s top ethics official said Wednesday that he lacked key facts when he concluded recently that Administrator Scott Pruitt’s rental lease with a lobbyist last year did not violate any federal gift rules. But in a new memo, which was obtained by the Campaign Legal Center and first reported by CNN, Minoli emphasized that he evaluated the terms of the lease only and not activities the document did not cover. The updated assessment comes as members of President Trump’s inner circle have become increasingly critical of Pruitt of his handling of several different ethical misconduct allegations, according to a senior White House official who spoke on the condition of anonymity to talk frankly. Despite Pruitt’s denials, Trump’s top aides are convinced he played a key role in authorizing massive raises last month for two staffers that joined him at EPA from Oklahoma. In an interview with Fox News’ Ed Henry on Wednesday, Pruitt implied he was not involved in the decisions on pay hikes for senior counsel Sarah Greenwalt and director of scheduling and advance Millan Hupp. White House officials also are uneasy with the administrator’s recent publicity push with conservative media outlets, including his appearance on Fox News. Pruitt and EPA officials were warned against his sitting down with Fox and other outlets. The same message was later relayed by Chief of Staff John Kelly in a phone call, with Kelly expressing dissatisfaction with Pruitt’s previous interviews, according to a senior White House official. But the administrator continued his media tour. The lease, for example, provided for the use of a single room. “All other space is controlled by the landlord,” it stated. But several EPA officials have confirmed that Pruitt’s adult daughter stayed in the condo apartment’s second bedroom for a period when she was working at the White House last year. The arrangement has come under intense scrutiny because Hart’s husband, Steven Hart, is chairman of the firm Williams & Jensen, which lobbies on energy issues along with other matters. He told The Post last week that he “had no lobbying contact with EPA in 2017 or 2018” and referred to Pruitt as a “casual friend” with whom he has had little contact. In recent interviews, however, Pruitt has described Hart as someone he has known for years. A copy of the lease, attached to Minoli’s most recent memo, showed that Steven Hart’s name had been scribbled out and his wife’s name handwritten in. According to a senior administration official, Vicki Hart herself made the change. While Pruitt’s ability to roll back federal regulations has stood him in good stead with the White House, the deluge of news about his financial dealings is now complicating that work. A presidential event scheduled for Friday to showcase a change in national air-quality standards has been canceled, according to a senior administration official who spoke on the condition of anonymity to discuss the agency’s planning process. As President Donald Trump boarded Air Force One for a trip to West Virginia on Thursday, he was asked by reporters if he still had confidence in Pruitt. “I do,” he said. On the plane, White House deputy press secretary Hogan Gidley was asked how long Pruitt might remain in office. At least three congressional Republicans have joined Democrats in calling on Pruitt to resign. The latest is New York Rep. Elise Stefanik, who according to news reports called for Pruitt’s ouster during a town hall meeting on Thursday. Still, other Republicans have continued to stand by the embattled EPA administrator. Republican Sens. Rand Paul of Kentucky and Ted Cruz of Texas both publicly backed Pruitt on Thursday, two days after longtime Pruitt supporter Sen. James Inhofe, R-Okla., also came to his defense. In media interviews this week, Pruitt repeatedly defended himself and highlighted the fact that agency ethics officials approved his Capitol Hill rental. He told the Washington Examiner that Steven Hart was a fellow Oklahoman who has no clients with business at the EPA. “I’ve had ethics counsel here at the agency, the office of general counsel and ethics officials, review the lease. They’ve actually looked at the lease. Most of the people who are criticizing me haven’t. 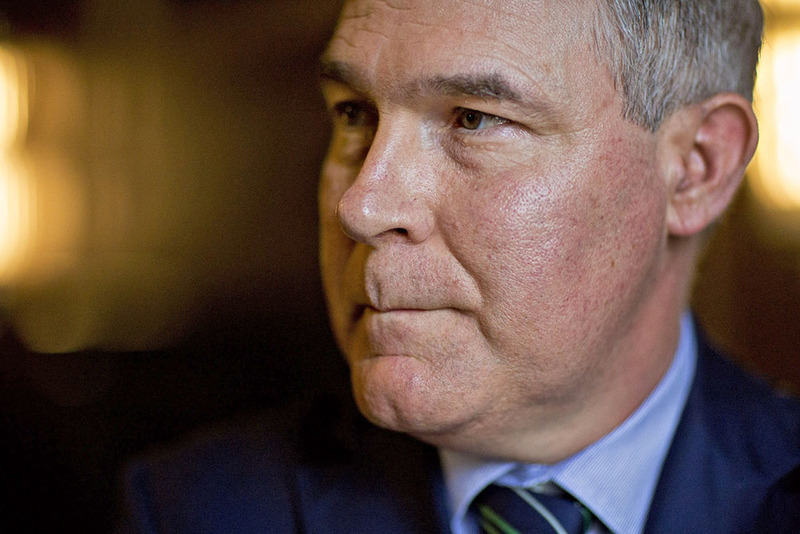 If you look at the lease, it’s very clear it’s market value,” Pruitt said. The administrator went on to reiterate that EPA ethics officials had approved the lease in recent days and again insisted that he had paid a market rate. “There were comps done by ethics officials here,” Pruitt said, suggesting that on Craigslist it is possible to find similar rentals in the same neighborhood for less than $1,000. “There is no connection between decisions Administrator Pruitt has made at EPA and any place he has lived. Any attempt to draw that link is patently false,” Bowman added. Despite Pruitt’s insistence that EPA career officials approved his 2017 living arrangement, which went from late February to early August, agency ethics officials weren’t aware of it until news reports late last week. Political aides then scrambled, contacting the ethics lawyers and pushing them to make a hasty ruling despite not knowing some details of the arrangement, according to people familiar with the agency’s response who spoke on the condition of anonymity to talk frankly. These individuals said that both Minoli and Justina Fugh, the EPA’s senior counsel for ethics and an agency veteran, signed off on the arrangement before news reports surfaced about Pruitt’s daughter also being in the apartment for a time. Vicki Hart said in a statement last week that she was not aware of the young woman’s presence there and that Pruitt would owe her additional rent if the reports were true. In his latest memo, Minoli explains that he found seven private bedroom rentals available for $55 or less nightly within a six-block radius of where Pruitt stayed. But he noted that the average cost of rental apartments on Capitol Hill is $2,361 and that the eight one-bedroom rentals available within three blocks of Hart’s condo rented for an average of $2,173 per month, according to Zillow. The sharp focus on Pruitt’s housing arrangement, as well as criticism of his first-class travel and of huge raises that two top aides recently received, has roiled his inner circle. Samantha Dravis, a longtime adviser who serves as senior counsel and associate administrator in EPA’s Office of Policy, submitted her resignation last week to work in the private sector. Her decision to le ave is unrelated to Pruitt’s recent ethics woes, according to several agency officials with firsthand knowledge of the matter. But it comes at a time when he is relying on an increasingly narrow set of advisers to navigate decision-making.